Three additional Assassin's Creed IV and four additional Watch Dogs missions will be exclusive to the PS3 and PS4 versions of the games. If you're one of those bi-curious gamers with multiple platforms, or are planning to pick up both the Xbox One and PS4 at launch, it's worth noting that the PS3 and PS4 versions of both Assassin's Creed IV and Watch Dogs will have around 60 minutes each of exclusive bonus content. 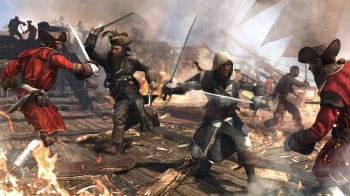 The PlayStation versions of Assassin's Creed IV will contain three additional bonus missions. The missions will follow Aveline, the first leading female Assassin who headlined the PS Vita exclusive: Assassin's Creed III: Liberation. Similarly, the PS3/4 version of Watch Dogs will contain four exclusive additional missions centered on a faction fighting for freedom in the digital age. "As vigilante Aiden Pearce, players can help them get their revenge against a Chicago tech mogul who did them wrong. Upon completion of the extra missions, players will unlock an exclusive suit for Aiden Pearce." While Sony claims that these packs will only be available on the PS3 and PS4, the Aveline pack for Assassin's Creed IV is currently listed on the Steam store as part of the AC IV Season Pass. Assassin's Creed IV will release on PS3, Wii U, and Xbox 360 on 31 October 2013 and will follow soon after on PS4, PC and Xbox One. Watch Dogs, which was initially slated for a November 21 release date, has been pushed back to "Spring 2014" on all platforms.